Pixel Scroll 12/12 Do Androids Look Up When They’re Dreaming Of Electronic Sheep? Live, from way later than the bleeping middle of Saturday night! (1) VOTER DECEPTION? People are gathering signatures for a San Diego ballot initiative that allegedly will help keep Comic-Con in town, but the organizers of Comic-Con told Deadline.com they have nothing to do with it and it won’t affect whatever they may decide. Will Comic-Con stay in San Diego? No word yet, but there’s a lot of confusion among fans on what’s going on with the organization’s desire to expand their annual convention in San Diego. Comic-Con International made the unusual move today of putting out a statement regarding a ballot initiative that was drawn up by a group called Citizens Plan for San Diego that seems to be at odds with their own desires for a contiguous expansion along the waterfront. Signatures are being gathered for a ballot initiative to keep Comic-Con in San Diego albeit a different spot, and those collecting signatures are actually advertising the initiative with signs stating “Keep Comic-Con in San Diego…. (2) THERE ARE NO BAD PRINCESSES. Check out the photos of what Hampus Eckerman likes to call Disney’s newest Princess at boingboing. Sophie’s parents tapped their friend, Megan, to turn a Chewbacca doll into a Princess Chewbacca birthday cake, using the “Barbie cake” method, and making Sophie’s third birthday just the bestest. (3) BYERS SURGERY. SF Site News reports Chunga co-editor Randy Byers is back home after brain surgery. Fan Randy Byers is recovering at home after undergoing brain surgery to remove a tumor. Byers will receive further diagnosis of his tumors and whether or not additional treatment will be needed, in about a week. December 12, 1941 — On this day in 1941 The Wolf Man is unleashed in theaters. 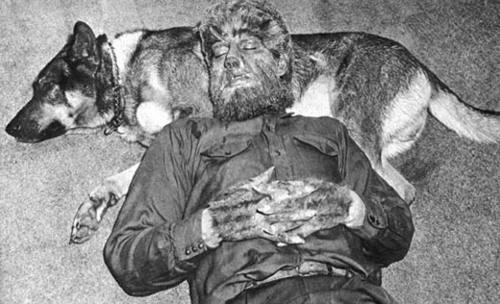 Did you know: the “wolf” that Larry Talbot fights with was Lon Chaney Jr.’s own German Shepherd. 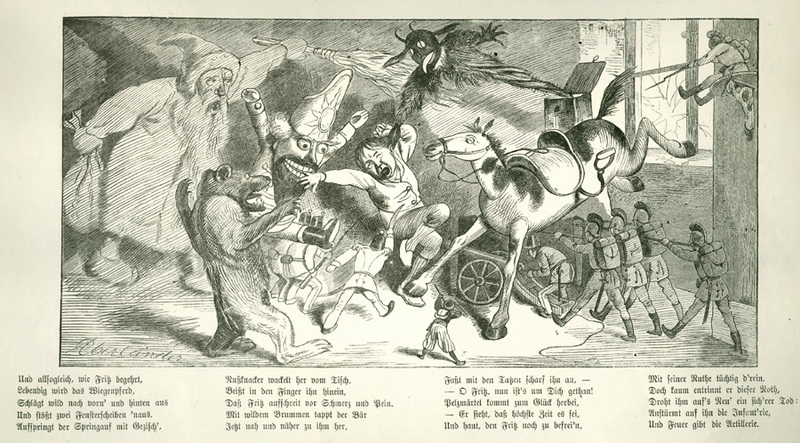 (5) KRAMPUS. 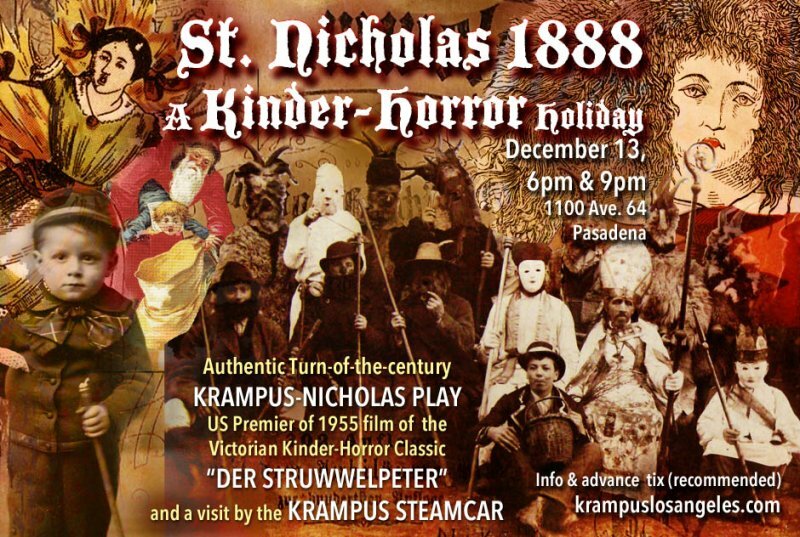 Now just hours away is a local stage performance of a Krampus-themed play. Of course Nicholas himself didn’t dirty his hands with whips. For that he had the Krampus. Today, every self-respecting hipster loves Krampus. But while your friends rhapsodize about the ersatz bubblegum Krampus of American comic books, TV, and monster fandom, tonight you’ll get a glimpse of the old devil in his original form – the Krampus of the ancient alpine “Nikolausspiel” or NICHOLAS PLAY, a folk theater production somewhat resembling England’s old Christmas mummers’ plays. (6) SAFETY LAST. Great video — Samurai Smartphone Parade. 99% of people think using a smartphone while walking is dangerous. 73% of people have used a smartphone while walking. (7) THE HUGO URGE. George R.R. Martin makes two recommendations for the Best Related Work Hugo in a new post at Not A Blog. THE WHEEL OF TIME COMPANION was a mammoth concordance of facts about the universe and characters of the late Robert Jordan’s epic fantasy series, edited and assembled by Harriet McDougal, Alan Romanczuk, and Maria Simons. It’s a labor of love, and everything one could possibly want to know about Jordan’s universe is in there. Felicia Day’s delightful look at her life, YOU’RE NEVER WEIRD ON THE INTERNET (Almost). (8) VERHOEVEN’S STINKER. Jason Fuesting, in “Starship Troopers: Book vs. Movie” for Mad Genius Club, takes a movie we both dislike and, by applying his powers of persuasion, still finds grounds for disagreement. Ultimately, Verhoeven takes a message needed badly by so many today, with their safe spaces and trigger warnings, and turns it into the film equivalent of those same children’s tantrums, a film so poorly written that only Mystery Science Theater 3000 could find use for it. A better director would have used Joe Haldeman’s “Forever War,” an excellent book in its own right. Haldeman makes all the points this film bobbled in “Forever War,” but using it would have meant going without all the Nazi imagery that Verhoeven is evidently fond of and not butchering an outstanding work in the process. Verhoeven’s film is surely satire, but I do not think he realizes the joke is on his side. (9) MST3K CAMEOS. There will be a bushel of celebrity cameos on the revived MST3K. MST3K creator Joel Hodgson announces a celebrity-packed cameo list that includes Seinfeld, Hamill, Harris, Jack Black, Bill Hader and Joel McHale for the new series. Fans also found out this week from Hodgson that the new MST3K writing team will include not only the cast, but also guest writers such as “Community” creator Dan Harmon and his “Rick & Morty” co-creator Justin Roiland. Others will include “The Muppet Show” writer Nell Scovell, “Ready Player One” author Ernie Cline, “The Name of the Wind” author Pat Rothfuss, musical comedy duo Paul and Storm, “Simpsons” writer Dana Gould, “The Book of Mormon” songwriter Robert Lopez and director of the next “Lego Movie” Rob Schrab. (10) RETHINKING SUSAN PEVENSIE. E. Jade Lomax of Hark, the empty highways calling has written a set of thoughtful, heart-tugging parallax views about what happened after Narnia’s Susan returned to England. …I want to read about Susan finishing out boarding school as a grown queen reigning from a teenaged girl’s body. School bullies and peer pressure from children and teachers who treat you like you’re less than sentient wouldn’t have the same impact. C’mon, Susan of the Horn, Susan who bested the DLF at archery, and rode a lion, and won wars, sitting in a school uniform with her eyebrows rising higher and higher as some old goon at the front of the room slams his fist on the lectern. Susan living through WW2, huddling with her siblings, a young adult (again), a fighting queen and champion marksman kept from the action, until she finally storms out against screaming parents’ wishes and volunteers as a nurse on the front. She keeps a knife or two hidden under her clothes because when it comes down to it, they called her Gentle, but sometimes loving means fighting for what you care for. She’ll apply to a women’s college on the East Coast, because she fell in love with America when her parents took her there before the war. She goes in majoring in Literature (her ability to decipher High Diction in historical texts is uncanny), but checks out every book she can on history, philosophy, political science. She sneaks into the boys’ school across town and borrows their books too. She was once responsible for a kingdom, roads and taxes and widows and crops and war. She grew from child to woman with that mantle of duty wrapped around her shoulders. Now, tossed here on this mundane land, forever forbidden from her true kingdom, Susan finds that she can give up Narnia but she cannot give up that responsibility. She looks around and thinks I could do this better…. Can we talk about Susan Pevensie for a moment? Let’s talk about how, when the war ends, when the Pevensie children go back to London, Susan sees a young woman standing at the train platform, weeping, waving. First, Susan thinks civilian; and second, she thinks not much older than me. They surge off the train, into their parents’ arms, laughing, embracing. Around them, the train platform is full of reunions (in her life, trains will give so much to Susan, and take so much away). (11) NPR RECOMMENDS. NPR staff and critics have listed 260 books they loved this year – click here to see the ones in the science fiction and fantasy category. (12) TOUGHER MEGABUCKS. Scott Mendelson at Forbes tells why he thinks “For ‘Star Wars: The Force Awakens,’ Breaking The Opening Weekend Record Just Got Less Likely”. But if The Force Awakens breaks the opening weekend record next weekend, it, like The Phantom Menace, will have to do it in a lot fewer theaters than expected. Walt Disney reported yesterday (according to the always trustworthy BoxOffice.com and Box Office Mojo) that Star Wars: The Force Awakens will be opening next week on around 3,900 screens in America. That’s only the 11th biggest theater count in 2015 and nowhere close to the biggest theater count of all time. The biggest theatrical release in 2015 was the 4,301 screen release for Minions ($115 million debut weekend). The widest release of all time was for The Twilight Saga: Eclipse which debuted on July 4th weekend of 2010 in 4,468 theaters. There have been 62 releases debuting in more than 4,000 theaters. If you presume that the figure is closer to 3,900 versus 3,999 theaters next week, that puts the Walt Disney release at merely one of the 100 biggest releases ever, about on par with Spectre and The Hobbit: The Desolation of Smaug. Point being, Star Wars: The Force Awakens isn’t going to have anywhere closer to the widest theatrical release of all time.